Tomato Fruitworm – Tomato Town organically grows heirloom tomatoes in the greater Kansas City area as well as Johnson County, Leawood, Lenexa, Olathe, Shawnee, Merriam KS, Independence MO and Kansas City Missouri, KCMO. Varieties include: Cherokee Purple, Brandywine, Stupice, Carbon, Black Krim, Black Cherry, Yellow Pear, Absinthe and Aunt Ruby’s German Green. Otherwise known as corn earworm and cotton bollworm. This larvae is not what you want to see in your garden. Early Friday, while the temperature was still tolerable, we went out to harvest tomatoes. Everything was fine until Farmer J said, “We have evidence of a fruitworm.” The evidence is tiny black sprinkles on your tomato leaves. Fruitworm poop. 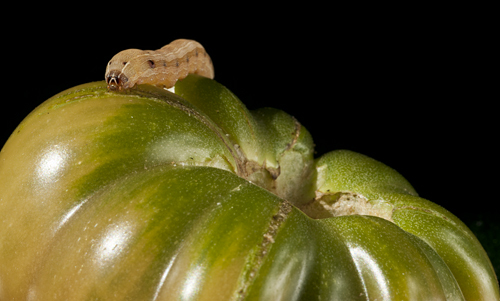 We searched the plant, and then found this little f@#$@$# inside a purple calabash tomato. I suggested an immediate execution. I wanted him to become bird food as soon as possible. “I have to photograph him,” Farmer J said. So, he took up residence in our tomato studio until the light was right, and then he was put in one of our bird feeders. Fifteen minutes later, and his crimes were paid for with his life. We typically have a few of these guys each season, and they are never welcome in TomatoTown. I hope this is the last one we see this season. What evil creatures are lurking in your garden? Here is a pdf that we found useful in identifying these creepy little caterpillars. This entry was posted on Friday, June 29th, 2012 at 7:53 pm. It is filed under Creature Feature. You can follow any responses to this entry through the RSS 2.0 feed.